Can you smell what The Rock is cookin’? The delicious aroma of beef is wafting through the air and momentarily clearing my hay fever-stuffed nostrils. Thanks Dwayne. And luckily for me, it’s mine and the internet’s favourite kind of beef – Twitter beef! If there’s two things we know about Dwayne ‘The Rock’ Johnson, it’s firstly, he’s very good on the ol’ social media, and secondly, he’s very good in the ol’ wrestling ring. So why anyone would challenge him to either of those things is beyond me? Step up James Corden. The cheeky-chappy presenter took it upon himself, for some reason, to call out The Rock on television while he was buddying up with Chris Pratt. What he didn’t account for, however, is that The Rock and Chris Pratt are action movie bros, and the bond between them can’t be broken, especially not by a silly little hashtag. 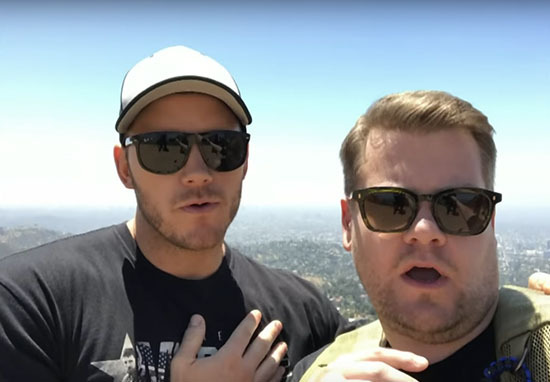 Pratt was appearing on a segment for Corden’s chat show The Late Late Show, in which they went on a hike up to the Hollywood sign. After posing for a few selfies on top of the iconic landmark, Corden adds some hashtags to his pictures. While classics such as #bestlife, #BFFs, and #sunglassbros – we all have sunglass bros, right? – do the rounds, Corden fires in a very questionable final tag in the form of #EatSh*tTheRock. I just thought you wanted to start some beef with The Rock. Of course, something like this doesn’t go unnoticed, especially someone as active online as The Rock – and he had a pretty decent response. Ha ha! This tweet is incredible! It’s beef season! One guy who knows something about Twitter beef with The Rock, and might be able to teach Corden a thing or two, is Kevin Hart. Earlier this month, The Rock posted a friendly dig at his bff on Father’s Day. After a heartfelt moment thanking his partner and daughter for their surprise gift to him, The Rock just couldn’t help but throw in a little dig at Hart. Simone, I love you, baby Jazzy, baby Tiana, daddy loves you. Baby Kevin Hart, daddy loves you too, even though you’re adopted. Happy father’s day. While it’s obviously nothing but affection between Hart and The Rock, a bare knuckle fight with Corden is something I’d definitely like to see.